Here at Flight Centre we call ourselves experts for a reason. Our consultants and head office staff are all well travelled, and one of the perks of working for us means having opportunities to discover new places, and then pass on that knowledge so others can enjoy memorable experiences around the world. Tell us as little bit about your trip to the Red Centre. I recently spent a few days in the Red Centre exploring the breathtaking landscape and experiencing Australia’s cultural heart. The trip was an extension of a trade show in Sydney and included a representative from Tourism Northern Territory, as well as some industry colleagues. We flew into Uluru and spent 2 nights at Sails in the Desert, which is the five star offering at Ayers Rock Resort, and looking great after a full refurbishment 2 years ago! What made you choose the Red Centre as your destination? Having already visited many of the cities and beaches of Australia, I really wanted to experience the desert as well as being able to see such an iconic natural site. With direct flights from Sydney, Melbourne and Cairns its really accessible and actually quite easy to incorporate into most itineraries. Its very difficult trying to pin down a highlight as all the experiences I had were incredible in their own way, but the three experiences that really stood out and that I have raved about since being back were dining under the stars at Tali Wiru, tasting traditional ‘bush food’ on the Bushtucker Tour, and riding a camel at sunrise with the most spectacular sweeping views of Uluru and Kata Tjuta in front of us. Tali Wiru, which translates to ‘Beautiful Dune’ in the local Aboriginal language, was an open-air fine dining experience like no other. 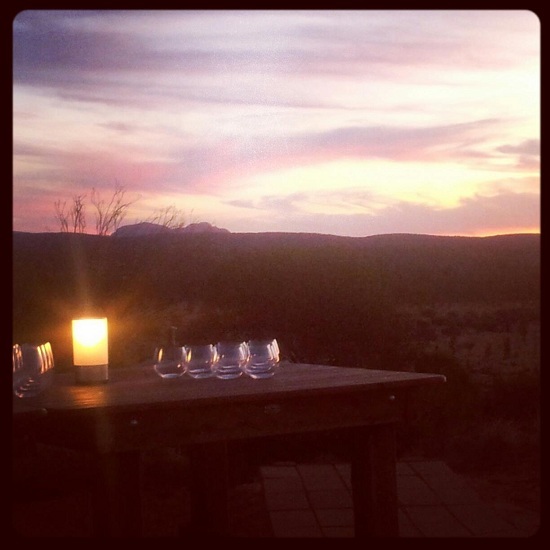 You arrive at the dune and are greeted with canapés and champagne as the sun sets to the sounds of a didgeridoo. 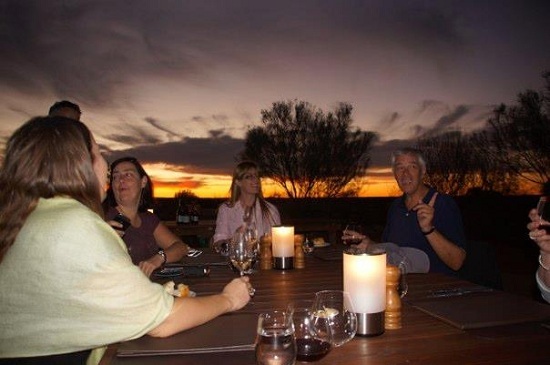 The colours of Uluru change with each minute and as the sun finally sets you are taken to the top of the dune where tables are set for a gourmet 4-course dinner with matched premium Australian wines. The experience finishes with hot chocolate, port and cognac around the camp fire with Indigenous storytellers who share their culture and history with you. Tali Wiru runs daily from April – October and includes hotel pick ups. Another great foodie experience is SEIT’s Bushtucker Tour which is just a 2 hour trip so great to do during the day as most other Red Centre experiences are at sunrise or sunset. On this tour you are guided by an Aboriginal host as you walk their country and learn how the local people were able to survive from the land. You will taste some of the bush foods and see what plants were used as medicine, as well as some native wildlife spotting. SEIT run these experiences daily and include hotel picks ups. Lastly, a trip to the Red Centre would not be complete without a sunrise experience – and without a doubt the best way to do this is from the back of a camel! Camels to Sunrise is an early start but worth it as you get acquainted with your camel and head off into the sunrise. The silence of the surroundings with the beauty and colours of the background was awe inspiring and aside from the odd camel grunts, it was one of the most peaceful experiences I’ve ever had. The tour completes with freshly baked beer bread damper and some local jams. Uluru Camel Tours run daily sunrise or sunset trips and include hotel pick ups and a light breakfast. What advice would you give to people travelling to Australia's Red Centre? You really need at least 2 nights to fully appreciate everything the Red Centre has to offer. Try and include one sunrise and one sunset activity as the colours and setting of the landscape changes so dramatically each time. Its currently not forbidden to climb Uluru, but its very much advised against so I would urge anyone to be respectful of this iconic site and enjoy it from the walk around the base or from one of the experiences mentioned here. If you really want to see the top then a helicopter would be my advice! Do you have any insider tips to share? Yes – make sure you book a window seat on the plane as the flight in will take you right beside Uluru and you will have some of the best views! Either side is fine as they generally have to circle back to land.